I met Rev. Drew Ludwig from Lafayette Presbyterian Church last week (google map). We sat down this morning in the church's sanctuary and talked about the use/re-use of religious structures in the context of a shrinking-city. Drew pointed to a number of religious buildings that have been repurposed in Pittsburgh - including the Church Brew Works - and the Centre for Social Innovation in Toronto as possible models for the reuse of religious structures in Buffalo. The fiscal challenges at Lafayette are daunting. The operational budget is nibbling away at the endowment's principal and membership has dwindled over the years. According to Drew, if the Diocese owned Lafayette it would probably already be closed. Drew is asking - "Do we have to collapse as a congregation, fold as a spiritual community for the building to find a new life - or can we become more proactive?" The solution, according to the emerging dialog here at Lafayette Presbyterian becomes a new and progressive mix of the secular and religious. Here's the podcast (17min, after the link). After completing his M.Div. at Palmer Theological Seminary he returned to his home town of Pittsburgh in 2004 as an assistant pastor. 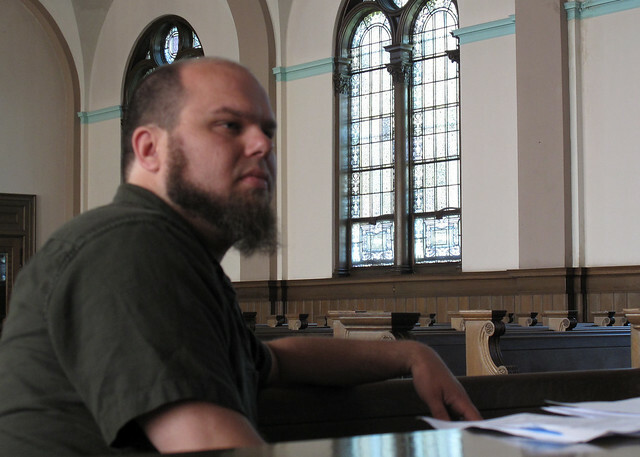 Drew became the pastor at Lafayette Presbyterian Church in 2007 and lives with his wife and two foster children in the neighborhood. 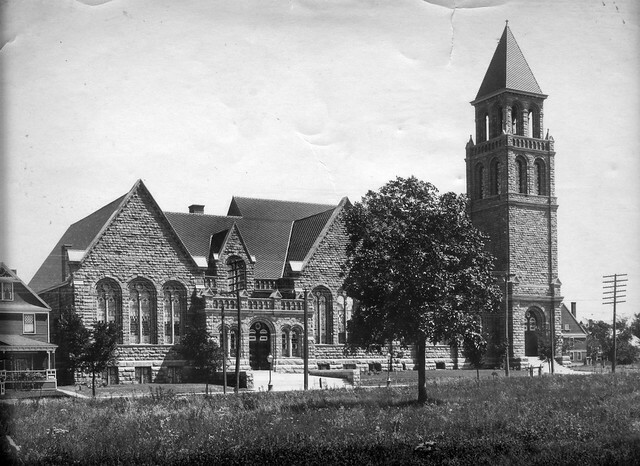 Lafayette Presbyterian Church was added to the National Register of Historic Places in 2009. 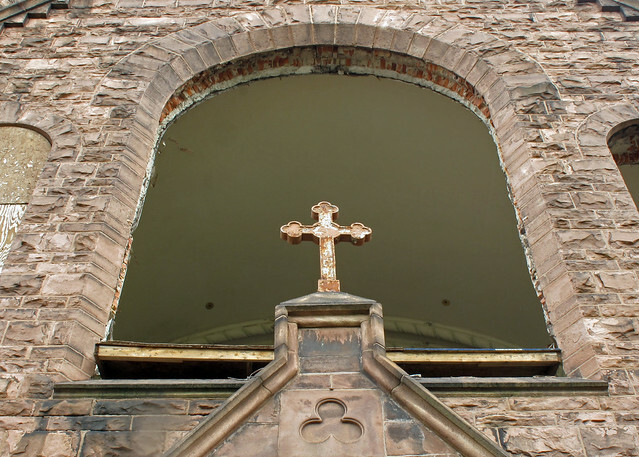 I walked around Lourdes Church on Main Street this afternoon (google map). Lourdes is now open on every side. Previous posts and pics clearly show that the windows in the rear and side have been open for years. According to neighbors that I spoke with, damaging winds recently blew the boards off the prominent Main Street windows. 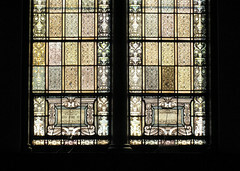 Interior pics from September 2008 show a church stripped of any traces of architectural detail and stained glass. Today's slide show of Lourdes Church. 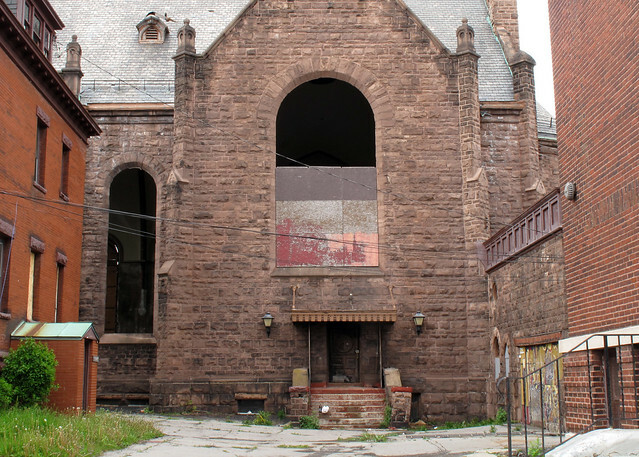 An entity controlled by local developer and New York State gubernatorial candidate Carl Paladino purchased Lourdes church last month for $40,000. The future of this Main Street landmark remains uncertain. Buffalo Rising is carrying this story today - House of the Hole-y. 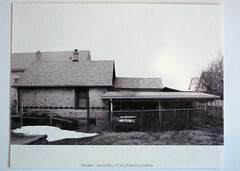 Creighton Randall purchased this single-family home at 268 Dodge Street (google map) from the City of Buffalo for $1. On weekends he's been working on renovations with friends and family. I caught up with Creighton late Saturday afternoon. Despite the blemishes and missing plumbing, the house was in good structural shape when Creighton bought the house. 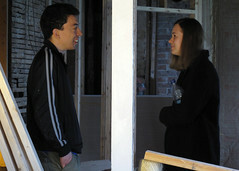 He is devoting additional time to completing renovations this summer and plans to move in this Fall. 268 Dodge Street is directly across from Masten Park, Johnny B. Wiley and the concrete remains of the City's WPA crown jewel, Civic Stadium, also known as the Rock Pile. (See Somewhere in Masten (12/18/08) for additional pics/maps.) Creighton was quick to point out the proximity of City Honors High School as we climbed the concrete steps and walked around Masten Park on Saturday. 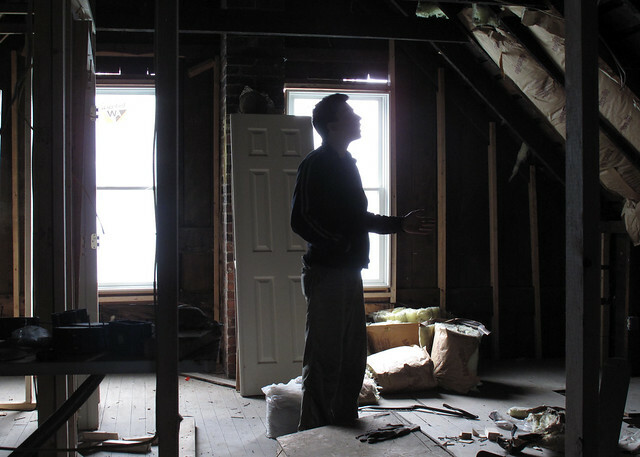 Creighton told me that he's taking a long-view on his new home and cautions against seeing the City's homestead eligible properties as quick way to 'flip' a property and see a short-term return. Creighton took a short break on Saturday and talked with me about his project. Here's a short thirteen minute podcast with Creighton after the jump. Creighton moved to Buffalo in 2002 from rural upstate New York near Albany and has recently completed a graduate program in urban planning at UB's School of Architecture and Planning. Creighton incubated and runs Buffalo Car Share, a local non-profit rooted in social entrepreneurship. If you'd like to know more about Creighton's new home and homesteading and possibly participating in a house-painting workday/party, drop Creighton an email - creightonr@gmail.com - to learn more and get the updates. I sat down with Richard Tobe yesterday afternoon at the EM Tea Coffee Cup Cafe in Hamlin Park. We talked about the Kensington. Rich moved to Buffalo in 1967 from Long Island. After graduating from UB with a degree in political science and completing his legal education at UB in 1974 he became Chief of Staff for Assemblyman William Hoyt. He served as Erie County Commissioner of Environment and Planning and Commissioner of Economic Development and Permit/Inspections for the City of Buffalo. He currently does economic consulting and teaches economic development seminars at UB Law School. Rich is a Richardson Center Corporation and Buffalo Niagara Riverkeeper board member. 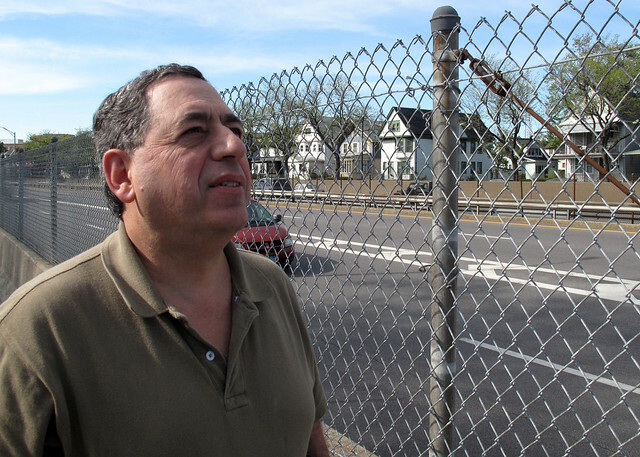 Our six-minute Kensington podcast is followed by a longer segment where Rich describes a number of battles with NYSDOT and highway construction in the City during the 1970's, including the controversial West Side Arterial. 73 Dodge Street is City-owned and available to any qualified prospective home owner for $1. 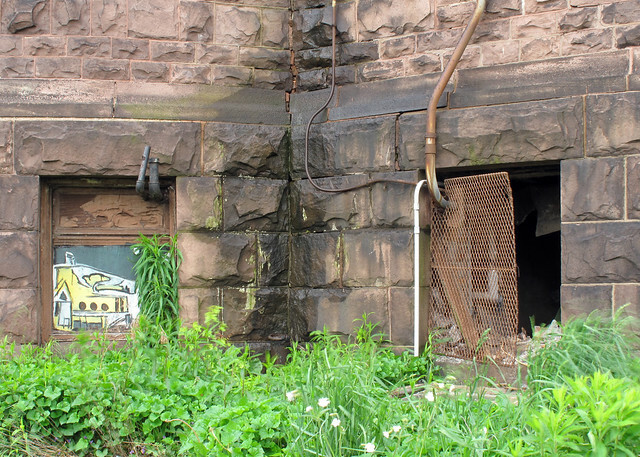 It's located one block from Main Street and around the corner from the Summer Street subway station (google map). Artspace and the Coe Place are right next door. 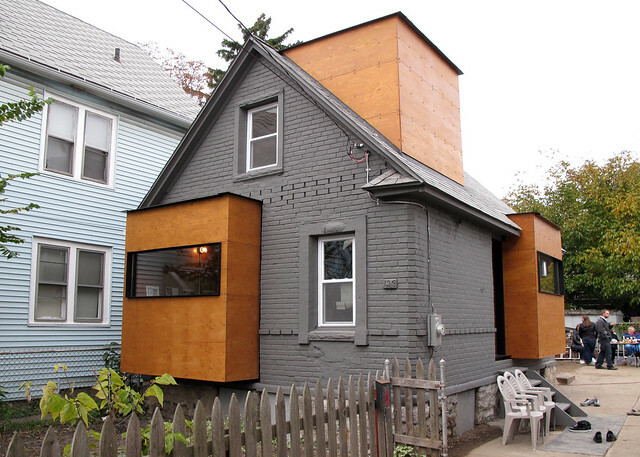 This two-family house appears to be in structurally good condition. The asphalt shingle siding is no doubt covering - and probably preserving - some clapboard and architectural detail that hasn't seen the light of day since the '60's. Such was the case just around the corner at 1042 Ellicott which was featured in this post, two years ago. Here's a 73 Dodge Street slide show. 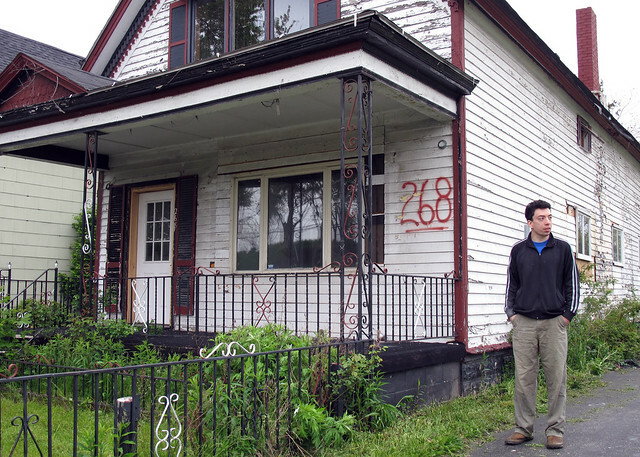 This house, along with 85 other city-owned houses were recently added to the City's inventory of 'homestead eligible' properties. The post and map about that development is available right here. Interested in making this house your home? John Hannon, Director of Real Estate, is waiting to hear from you. The City's Division of Real Estate can be reached at (716) 851-5261. Stephanie Barber is the president of the Hamlin Park Taxpayers & Community Association. I sat down with Stephanie at the Merriweather Library on Jefferson Avenue to talk about the Kensington Expressway. 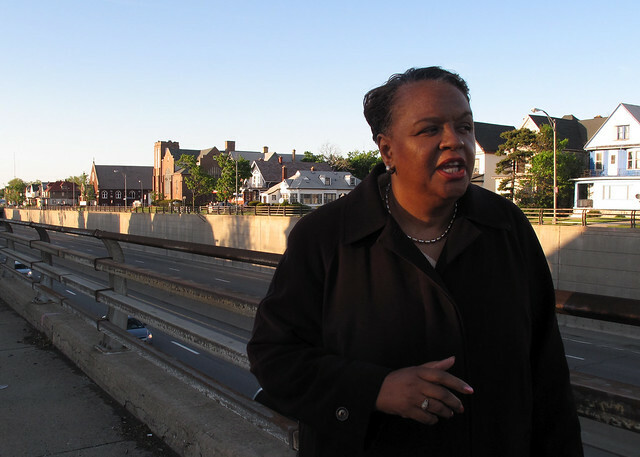 Through her advocacy work as president of the Hamlin Park Taxpayers & Community Association, Stephanie persuaded New York State Senator Antoine Thompson to direct funding towards a feasibility study to fix the Kensington. 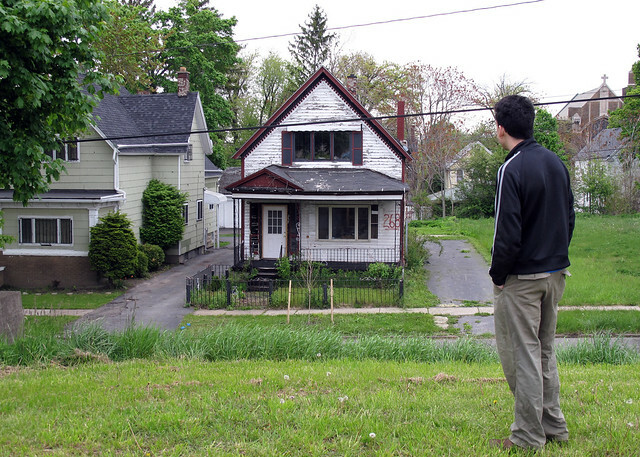 A number of fixBuffalo readers sent this in today - WGRZ's Special Report: Abandoned Housing Crisis in Buffalo. It's notable that Mayor Brown and his staff now understand the extent of problem and how intelligent planning and new policy will help. 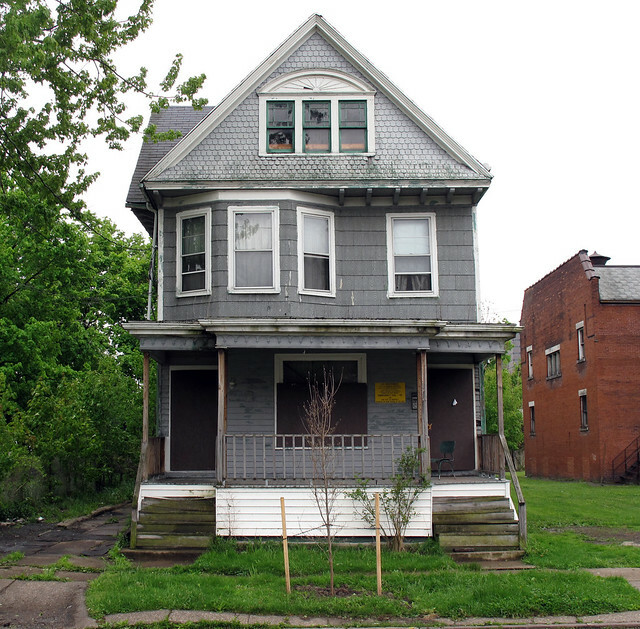 UB architecture students purchased this brick cottage at 139 Howell Street (google map) at the City's tax-sale a few years ago. The redesigned minimalist space is clean and the space, totally liveable. 139 Howell - the "Quad House" - is featured in ExinteriorDesign and there's a slide show with interior images in this recent Wallpaper review. 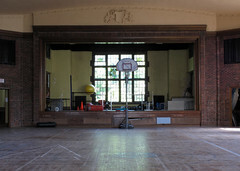 Here's a before pic and a construction series that I snapped during last Fall's open house. With UB architecture students showing what's possible with a brick cottage in Black Rock, it's even easier to imagine breathing life into a number of other City-owned brick cottages. 41 Milnor in Downtown Buffalo and 16 Harwood Place, right around the corner from Mayor Byron Brown's residence, come to mind. Both are available for $1. 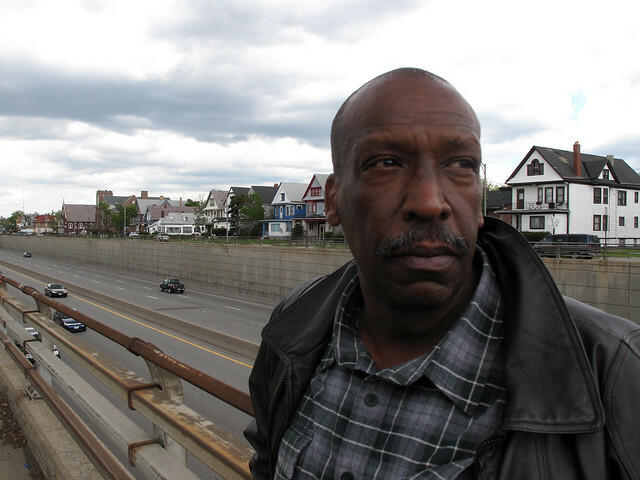 Anthony Armstrong from LISC-Buffalo has been analyzing and mapping abandonment and vacancy issues in Buffalo for the past four years. He's compiled Buffalo Vacancy, a wiki designed to share the unique data sets he's synthesized involving HUD and United States Postal Service undeliverable addresses in Buffalo, NY. I caught up with the Anthony the other day and he told about the most recent series of maps that he's compiled. They provide a strong visual statement about abandonment and vacancy the City is (not)confronting. This map is a snapshot, as of 12/31/09. 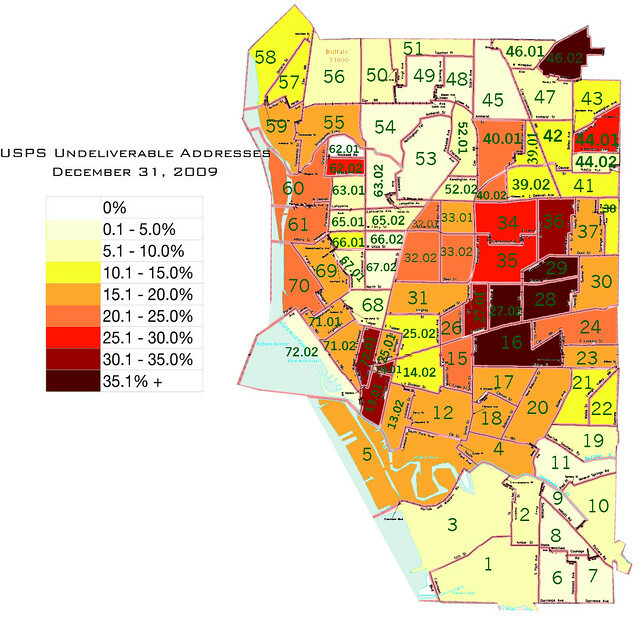 The other maps involve trend data covering the four year period 2005/2009. Central Park Plaza activists and neighbors gathered and rallied this morning urging City officials to take immediate action. If stores aren't closed, the shattered store front windows are the norm and contribute to making Central Park Plaza (bing map) one of the City's most desolate and dangerous landscapes. The Brooklyn based entity that owns the Central Park Plaza seems to be immune from Housing Court's reach. I met Dawnette Leftwich, Beverly Davis and Daria Pratcher this morning. They are organizing neighbors and city residents to help transform the severely blighted Central Park Plaza. You can connect via facebook - Help Revitalize Central Park Plaza - and learn more about what's happening and what's needed to help bring about immediate and necessary change in this part of the City. The Buffalo News covered this morning's story. Here's a short slide show to further acquaint you to Central Park Plaza. 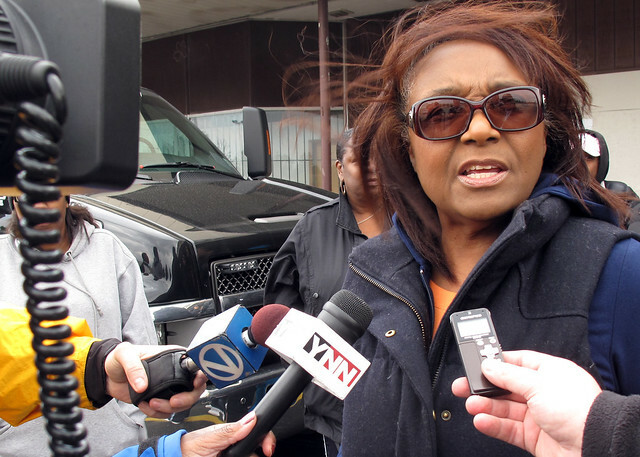 Terry Robinson grew up in the Humboldt Parkway neighborhood. He graduated from Calasanctius High School in 1972 and studied political economy at Princeton and Harvard. He lives with his wife on Humboldt Parkway. Terry's many activities in the community include being a trustee of Preservation Buffalo Niagara. I sat down with Terry in the backyard of his Humboldt Avenue home that's directly across the street from the Kensington. The podcast's first seven minutes of q&a are followed by Terry's favorite childhood reflection about growing up on Humboldt Parkway. Demone Smith, Masten District Councilmember, introduced a resolution (.pdf) yesterday urging NYSDOT to study a third option - the Boulevard Option - as New York State prepares a $2 million feasibility study to fix the Kensington. Currently two options are on the table, each involving placing a "cap" over the Kensington over a one-mile stretch between East Delavan and Best streets. These two options would cost between $350-$500 million. The Boulevard Option, which would fill the entire highway and restore Humboldt Parkway as a multiway boulevard, would likely cost much less. Demone Smith's resolution calls on NYSDOT to put all feasible options on the table in its "Study to Cover Portions of Rt. 33," including the Boulevard Option. WKBW is running with the story. This afternoon I caught up with Demone and discussed the importance of his resolution and the new Boulevard Option. Here's the podcast. Today the Buffalo News carried a spot-on editorial about Buffalo's (new) Green Code - ReThinking the City. Making redevelopment easier is a critical factor in reviving Buffalo, and must remain a key City Hall goal. Good zoning codes are a part of that process, and long have troubled developers trying to wend their way through the system— so the mayor’s recent announcement, in the historic Larkin District, of a three-year $2.1 million overhaul of zoning regulations can be put in the category of good news. Even better, there’s a state reimbursement of $750,000 toward that effort. The latest redevelopment vision for this Rust Belt city would trend more toward “green urbanism” and, for the first time in decades, include a “walkability” aspect. 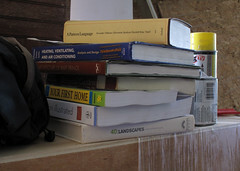 Let’s get started...read the rest. 86 City-owned properties were recently added to the City's list of 'homestead eligible' properties. This list includes 94 Northampton. These properties (.pdf ) are now available for purchase to qualified prospective owner-occupants for $1. Interested? - John Hannon, Director of Real Estate, is waiting to hear from you. The City's Division of Real Estate can be reached at (716) 851-5261. 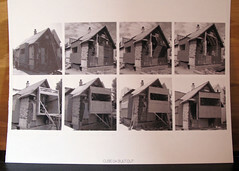 Update - 5/3/10 - here's the official catalog of City-owned residential property (.pdf) that's currently available for sale.